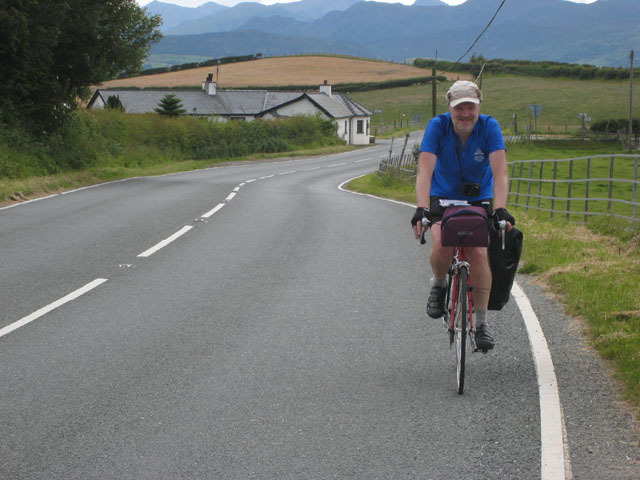 For our fifth annual expedition we had chosen to ride from Holyhead, on Anglesey, back home to York, over 3 days in July 2008. The logistics of getting from York to Holyhead by train were complicated, with three of us travelling out on the Thursday evening and the other three setting off at uncivilised times on Friday morning (especially Jim). Would Paul be back on form, following his failure to complete last years ride? Would I fall off my bike, having recently fitted SPD pedals? Would Andy's tubeless tyres be up to the task? Read on to find out! Paul (Veggie), Andy and I travelled out on the 15.58 departure from York to Manchester. We had reserved two bikes on this train and one on a later service, but hoped to get all three bikes on the 15.58, which we did without any problems. Before departure, it was announced that we would be diverted via Castleford, due to signalling problems on the direct route. This was bad news, as it put our Holyhead connection (and the cycle reservations) at Manchester Piccadilly at risk. We arrived in Piccadilly with about 3 minutes to spare, so we had to dash through the rush hour crowds with our bikes from one side of the station to the other. We just made it, but didn’t have time to work out where the cycle storage area was on the train, so boarded at the nearest doors. We found the place for bikes in the next coach, so at Oxford Road we got off the train, ran down the platform and boarded again at the correct place. We had no problem getting 3 bikes to fit in the cycle space. We reached Holyhead on time and cycled to the Wavecrest guest house. After locking our bikes up in the garage and getting ourselves sorted out, we walked into town. There is one pub in Holyhead which appears in the Good Beer Guide, called “79”, so we called in there for a drink. It didn’t seem a very welcoming place, and there was nowhere to escape the loud music, so we only stayed for one drink before moving on. We walked around the town looking for somewhere else to drink decent beer (and possibly eat) but without much success. Holyhead seemed to be very run down. We had a leisurely start to the morning, with an 8.45 breakfast, and loaded up our bikes before rolling down the hill into town. 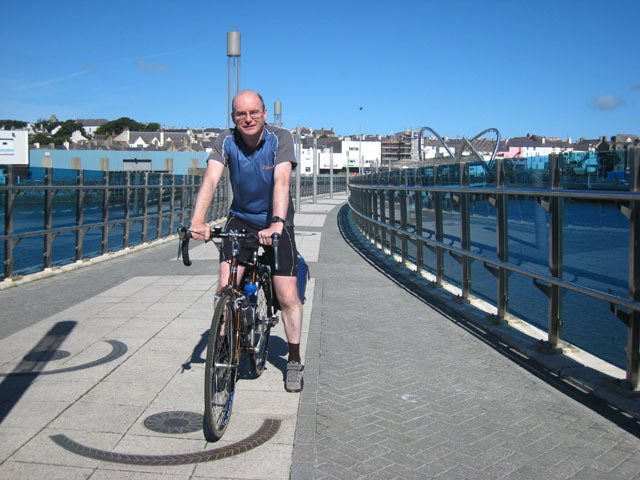 There is a new bridge for cyclists and pedestrians, linking the town centre with the harbour and station area. It is supposed to encourage ferry passengers to visit the town, rather than just passing through, but I’m not sure it’s all that successful. Jim was waiting for us on the station, and we remained here for the arrival of Brent and Greystone’s train at 10.15. After a brief pause for photographs, the ride got underway at 10.20. We used the Four Mile Bridge to cross from Holy Island onto the main island of Anglesey, and continued along gently undulating B roads. It was very pleasant in the morning sunshine. There were good views of Snowdonia ahead of us, and we could identify Snowdon and the Llanberis Pass to the left of it, which would be our route through the hills. 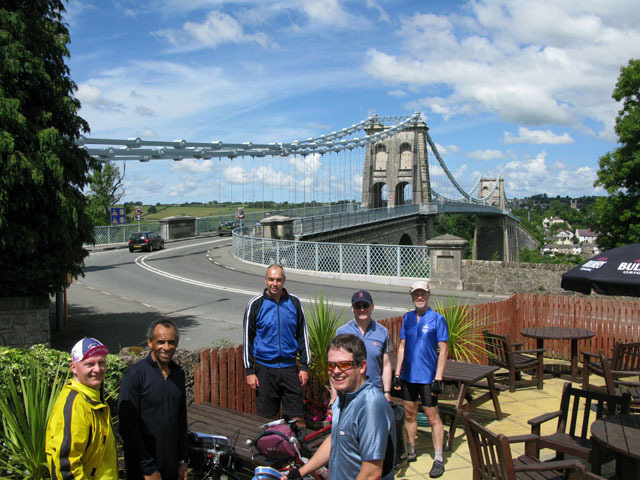 We crossed the Menai Bridge, and called at the Antelope pub for refreshments (non-alcoholic). Our first real hill climb took us through the outskirts of Bangor. We took a minor road towards Llanberis, but missed a turning and ended up back on the A4087. There was a long uphill stretch towards Llanberis, and Jim got left behind. The rest of us carried on at a fairly fast pace, but we stopped by the lake in Llanberis and allowed Jim to catch up, and have a breather. We didn’t have time to call in at either of the two steam railways that operate from here. The road through the Llanberis Pass starts off reasonably gently uphill, but it is a fairly long ascent. Nevertheless, I found the great scenery and the prospect of reaching the summit very motivating, and kept pedalling hard right to the top. The road steepens just before the summit at Pen-y-Pas (359m), and naturally Greystone was the first to get there. The descent from Pen-y-Pas was excellent, well worth the effort of getting there. The scenery was wonderful, the sun was shining, the road surface was good, and there wasn’t too much traffic. Even after the descent, it was easy going for most of the way to Betws-y-coed. We stopped here for a late lunch, which for me was a large portion of chips from a fish & chip shop. From here we took a quiet B road to Llanrwst, then there was a long climb out on the A548. Paul was complaining that he had eaten too much lunch. Once we had reached the end of this climb, it was gently downhill for several miles. Paul’s planned route was to turn off onto a hilly minor road, but as the main road was not too busy, we decided to stay on it. There was another hill to climb before the coast, but then we had a very fast run down to Abergele on the other side. At the beginning of the coastal cycle track towards Rhyl, Greystone stopped because his rear pannier rack was coming loose, and he found that a screw had broken, with part of it left behind in the frame. He spent about half an hour trying to remove the remainder of the screw, but had to admit defeat. He was able to do a temporary fix to secure his rack, and we carried on for the last few miles along the coast to Rhyl. We did a circuit of the town before finding our hotel, the Westminster, on the sea front, at half past six. After showering and changing, we walked into the town and had a drink at the Crown pub. It wasn’t serving food, so we went to a Chinese restaurant, and had a good meal there. Some of us returned to the Crown for a final drink before bed. We declined the hotel’s £10 breakfast, and instead checked out and rode into town to find a café. The Snax café on the main street met our needs, and their Snax Mega breakfast was very popular with the riders, at half the price of the hotel’s. We set off at ten past nine, in rain. 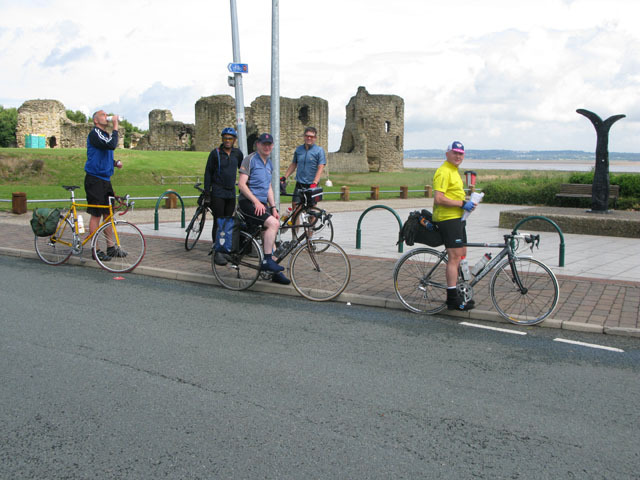 Our route took us inland initially, past the castle at Rhuddlan, and then eastwards through Dyserth, after which there was a long uphill stretch. The gradient levelled off, and by the time we had reached Whitford the rain had stopped. Near Pentre Halkyn we had a bit of difficulty finding our intended route, as we were using one of Paul’s old maps, which didn’t show the new route of the A55. With a bit of guesswork we found the minor road we were looking for, and followed it downhill to Flint. This road, Cornist Lane, was very narrow and completely hemmed in by trees in places, making it quite dark. From Flint we followed the main road as far as Shotton. A car had just left the road and landed on its side, but I didn’t see it. There was a bike shop in Shotton (Shotton Cycles), and Greystone took his bike in to see if they could do a permanent repair to his rack. After nearly an hour, they decided to give up. As the weather had brightened up, I decided to get my camera out of the pannier, but couldn’t find it. Had I lost it, or was it just buried deep? 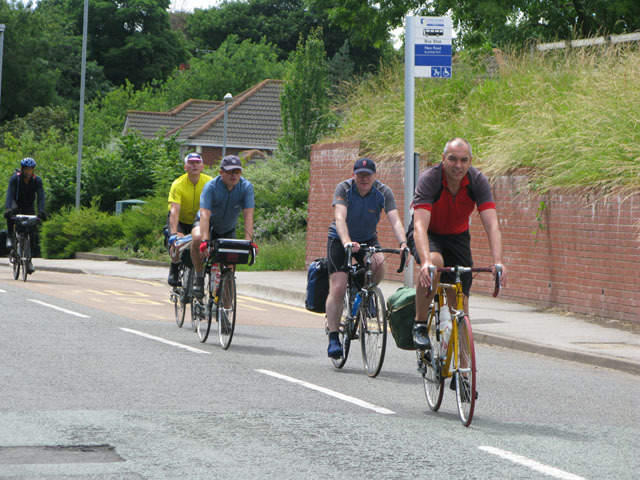 We pressed on, crossing the River Dee at Hawarden Bridge and then taking a cycle track which followed an old railway. This was very good track, with a good surface, few obstacles and no broken glass. It took us over the border into England and around the north side of Chester. We didn’t go into the centre of the city because of the time we had lost, but stayed on the track to its end, then got a little bit lost in the residential streets. We got back on our planned route, which continued through Mickle Trafford, Mouldsworth, Delamere Forest, Norley and the industrial parts of Northwich. The Anderton Boat Lift was our planned lunch stop, and by the time we got there it was sunny, so we were able so sit outside. Just as we were about to leave, there was a sudden heavy shower, so we waited for that to pass over before setting off again. We continued across Cheshire on minor roads, which took us through Knutsford and Mobberley. Just before Alderley Edge, Brent got a puncture, his first on one of these rides. It was all posh houses and expensive cars around here, and it seemed a world away from Rhyl where we had started the day. The roads were in a terrible state though, especially near the edges. We made a navigation error in Prestbury and headed uphill for a mile in the wrong direction towards Macclesfield, so had to retrace our route and then take another road uphill out of Prestbury. North of Bollington, Paul suggested that we took a cycle track, the Middlewood Way, to Marple. This follows an old railway, so it would avoid some hills. The only problem was that it was wet and muddy. After a couple of miles I could feel all the grit crunching and grinding in my chain and gears, not doing them any good at all. We left Marple on the A626 which was a long, steep climb, not at all what you want at the end of a long day. After the gradient had levelled off, Andy stopped as he was concerned about his tubeless tyres, which he said felt as though they were slipping on the wheel rims. He re-glued them and we continued with a fast descent into Glossop, followed by a weary drag up the main street. My legs had just about had it by the time we arrived at the George Hotel. While we were parking bikes, I noticed that my front tyre was soft, but decided to leave it until the morning. We freshened ourselves up and met in the hotel bar, where my first beer of the day went down very quickly. Our eating venue, the Globe, was chosen by Paul because of its vegetarian menu, and we didn’t realise until we got there that it also brews its own beer. Some of us also had a pint in the Star Inn before returning the the hotel for a good night’s sleep. Anderton, near Northwich. Just before arrival at the boat lift. I got up early enough to change the inner tube on my front tyre before breakfast. The puncture was caused by a small piece of glass in the tyre. I also managed to catch a weather forecast, which suggested that we would have a lot of rain today. It wasn’t raining at the moment, but it was very cloudy. We had breakfast at 8.30. Greystone caused problems for the hotel staff by asking for a mushroom omelette. “I’m not sure that we can do omelettes” was the waitress’s response. She disappeared into the kitchen to find out, while Greystone wondered if he should offer to make one himself. The waitress returned with the news that they had no omelette pan, but they could make scrambled egg, so Greystone had that. The rain had started by the time we hit the road at 9.50, and Paul optimistically predicted that we should be in the Maltings by three. We began with a climb out of Glossop, but after a couple of miles there was a downhill stretch to Torside. A little further on we crossed the dam at the end of Woodhead Reservoir and joined the busy A628 which would take us over the Pennines. The ascent to Woodhead is not steep, but it was not particularly pleasant in the rain and heavy traffic. Before we reached the summit, Andy stopped with a problem with his rear sprocket block falling apart. We pulled into a lay-by and he proceeded to strip the block down in the rain, dropping his balls in the dirt in the process (ball bearings, that is). He managed to recover enough balls to re-assemble the block, and we set off again. The summit at Woodhead marked the highest point of our ride (410 metres), and it was some comfort knowing that the average gradient for the rest of the day would be downhill, although we knew there were a number of climbs still to come. From Woodhead we took the minor road down to Dunford Bridge, and this would have been an exhilarating descent had it not been for the driving rain. Andy had his first tyre problems of the day at Carlecotes, so we were delayed here while he re-glued one of his tyres. We decided to give him the nickname “Tubs”, which of course refers only to his tyres and has nothing to do with his weight. We missed a turning in Hoylandswaine, and had to retrace our route for half a mile. Andy was still unhappy with one of his tyres (or maybe both of them) so we took cover in a bus shelter. Paul set off on his own, as he was getting cold. Eventually, Andy was ready to roll once more, and we all set off. Half a mile out of Hoylandswaine he got a flat tyre, so we all stopped again, except Jim who carried on to see if he could find a shop in the next village. When Andy had fitted a new tyre, we set off once more, but soon lost Andy again. We met up with Jim and Paul in Cawthorne, and found another bus shelter to wait for Andy. The delays were now becoming a severe hindrance to our progress, and although at first we were happy to stick with Andy and help him, we were now spending as much time stationary as we were moving. At this rate it would be midnight by the time we reached York, so unfortunately it was time to say “Andy, you are the weakest link – Goodbye!” Actually, Andy had come to the same conclusion, and we decided that Darton was the nearest station he could travel back home from, assuming that it had a train service on Sundays. We got to Darton with no further problems, and the rain was starting to ease off. When we got to the station, we found that Andy had just missed a train, and had nearly two hours to wait for the next. We left him anyway, and then made good progress through Royston and Purston Jaglin to Pontefract, where we had decided to stop for lunch (at half-past two, rather later than we had hoped). We did a circuit of the town looking for a café, but most places were shut and we had to settle for a branch of Subway. As we were parking our bikes, Jim managed to park his on a piece of broken glass, so he had to stay outside and change an inner tube while the rest of us sat inside and filled our faces. Actually, we waited for him to have lunch as well. We were now on familiar roads, not too far from home, and the rain had stopped. From Sherburn we took the B road to Cawood, then Stillingfleet. We decided to take the cycle route as far as Bishopthorpe. This proved to be a bad decision. At first we made rapid progress as the wind was now behind us, and the sun was shining. But under the A64 bridge, where Bishopthorpe’s teenage alcoholics hang out, the track was covered in broken glass. Brent and Paul both got punctures, which was frustrating as we were less than 3 miles from the end of the ride. Just after 5 o’clock we arrived at the Maltings for a celebratory drink or two, although it was a shame that Andy was missing. We tried to contact him to see if he would be joining us, but he wasn’t answering his phone. Maybe he was too ashamed to show his face. For the five of us who completed it, it had been another successful ride, only slightly dampened by the weather and slow progress of the final day. Our riding time for the day was only 4 hours 43 minutes, so it could have been done as a half-day ride in theory. I called the Westminster Hotel in Rhyl about my camera, and I was pleased to hear that it had been found in my room. It was posted back to me promptly, so at least I have some photos of the first day of the ride. Most of the photos on this page were taken by Paul.